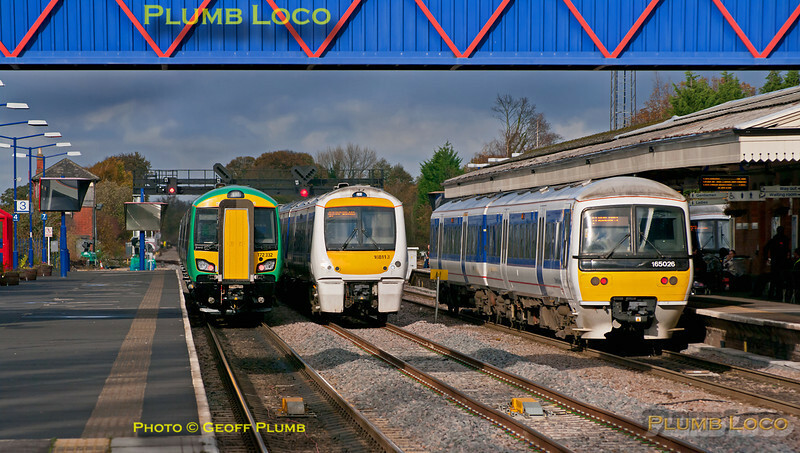 All four tracks at Princes Risborough occupied once again! On the left is London Midland 172 332, together with 172 221, running mileage accumulation turns. This is 5Z02, 12:56 from High Wycombe to Dorridge and it has been stopped in the station to allow a northbound Chiltern non-stop service to overtake. It would normally have been put into the centre road but this was required for the passage of 168 113, here seen southbound with the 11:55 from Birmingham Moor Street to Marylebone. On the right is 165 026 with the 12:13 from Marylebone to Banbury which arrives here at 12:57 and departs at 13:10 after the northbound non-stopper has passed. An unidentified 165 is also just visible in the bay with the Aylesbury shuttle. The 172s have the shunt signal "off" to put them on to the stub of the Thame branch to get them out of the way and the train had pulled forward but stopped short of the signal as this move was cancelled. The northbound non-stop was then put through on the centre road... 13:07, Friday 4th November 2011. Digital Image No. GMPI10551.